East Greenwich Pleasaunce is a small, historic park in Greenwich, London SE10, with a main entrance in Chevening Road and a smaller gate half way up Halstow Road (click here for maps). The word ‘pleasaunce’ is thought to derive from French and means ‘a secluded garden’ or ‘enclosed plantation’ designed to delight its users. It was formerly the cemetery for the Royal Hospital for Seamen at Greenwich – founded in 1694 by William III in honour of his deceased wife, Mary, and largely completed in 1751. The Hospital provided residential accommodation and medical treatment for Royal Naval veterans, and educated their children, before closing in the 1860s and becoming the Royal Naval College in 1873 (to 1998). The Pleasaunce was chosen as a new burial ground for Greenwich Pensioners in 1857 on closure of the previous burial ground on Romney Road – now the site of Devonport House – in that year. In 1875 (as the memorial plaque attests to on the Western boundary wall – click on the photo, left) around 3,000 bodies were moved to the Pleasaunce to make way for several building projects. One was a new dining hall being built for the Greenwich Hospital School (now the most westerly wing of the National Maritime Museum), another was the extension of the Greenwich railway east from the town centre to Maze Hill and beyond. More remains were tranferred with the building of Devonport House. 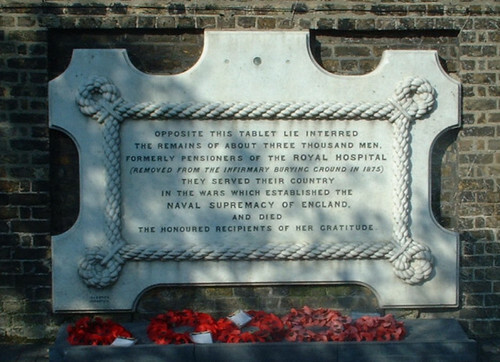 The Pleasaunce contains the remains of sailors who fought at the Battle of Trafalgar and in the Crimea, as well as war graves from the First and Second World Wars. 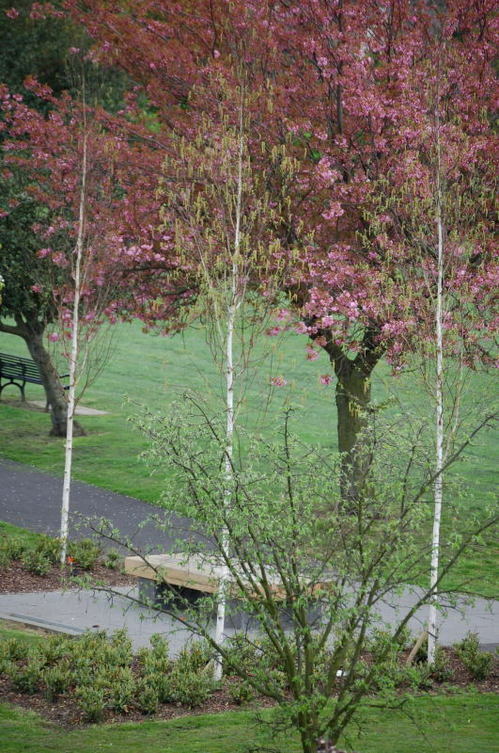 In 2005 Greenwich Council funded a new memorial – comprising a large bench, paving, shrubs and white-barked birch trees (click on the photo to enlarge) – adjacent to the patch of land where the re-interment took place. The Pleasaunce had passed into the hands of Greenwich Council in when 1926 Greenwich Hospital sold the Pleasaunce to the London Borough of Greenwich for the regal sum of £450. One of the conditions of sale was that the Admiralty would have the right to use part of the Pleasaunce as a burial site ‘in perpetuity’. It was also agreed that the Council would keep the park in good order. For a far more erudite and detailed history of the Pleasaunce please see the piece kindly submitted by Pieter van der Merwe of the National Maritime Museum.